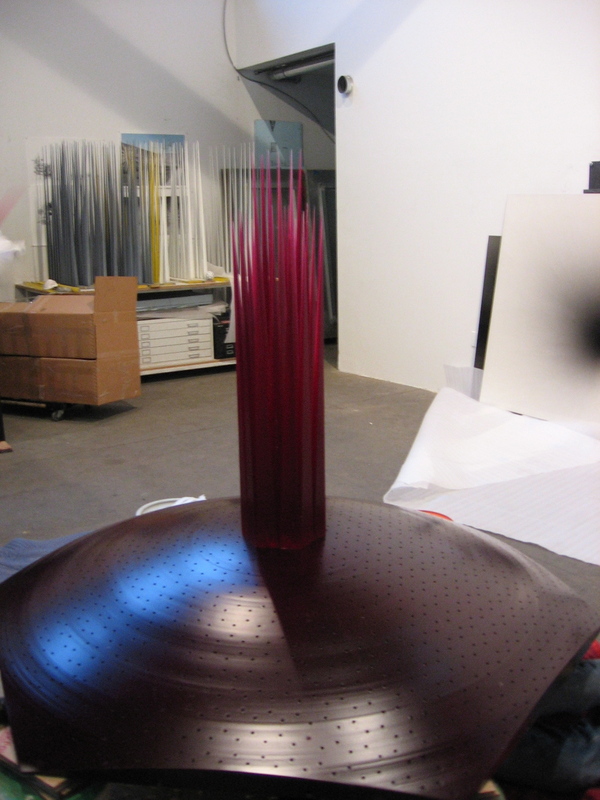 The goal of the project was to create a wall hanging piece that consisted of a 6’ diameter hand spun aluminum dome covered with over 1400 red resin spikes. A system was developed in house using molds made from polycarbonate that were cut from a custom table saw jig to create various length spikes with the same base footprint. The plastic spikes would then be mounted to the dome via steel pins. We created a complex geodesic pattern so the dome could go through a 5 axis machining process to allow all the spikes to fit on the disc and angle perfectly toward the center of the sphere created by the dome. The final product was shown at Causey Contemporary in Williamsburg Brooklyn NYC.